surplus magnetron magnets, and filament transformers. the RCA KU and BK series, The RCA Starmaker pressure ribbons, and the Western Electric 639 and 670.
out to find ways to improve performance with modern network and computer methods. And listening. made perfect sense. It certainly doesn't today. and a resistance controlled ribbon for pressure. Mass control means that the largest reaction force is inertia, and resistance control means it's energy dissipation or transport. Both those conditions respectively are required for flat response in a system where the electrical output is dependent on velocity of a conductor in a magnetic field. As has long been known the sum of those two ribbons can make cardioid or any other first order gradient pattern. But there were some fundamental problems with this approach. The biggest was this: the omnidirectional pressure section wasn't really omni at all frequencies. 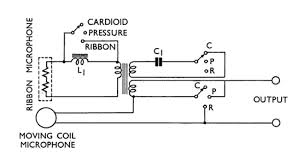 Diffraction tended to make off axis response quickly drop off above about 2 kHz, so the cardioid and similar settings "grew a back Lobe"
at high frequencies the pressure gradient ribbon was simply rolled off there...using the pressure ribbon only. A little thought shows that the sum of two transducers at low frequency but only one at high frequency tended to make a bass shelf effect of 6 dB in cardioid for example. This was dealt with either with a crossover network or restricting the frequency range or both. This made much better pattern control, as long as the frequency range was restricted particularly on the figure 8 setting. 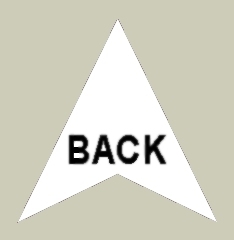 There was a compromise in vertical pattern, because the two elements are spaced apart. RCA did a similar thing earlier on the 77 A, B, and C and KU2 by acoustical filter means. unidirectional microphone, the model 55 Unidyne. resistance/inertance opening that formed a constant group delay low pass filter to sound presented to the back of the ribbon. and fully closed an omni pattern, with cardioid and the like in between. The result was an Iconic microphone. In general the patterns were better than the two ribbon approach, but the labyrinth (we'll talk about that later) and rear port assembly did tend to create a longer front to back path and thus reduced high frequency response particularly in the figure eight setting. Again, not so much a problem in a ten kHz world...and at lower frequencies it raised sensitivity. 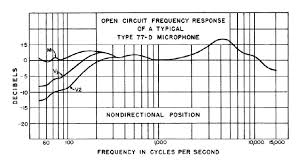 At non figure 8 settings it was less of an issue....the rear port low pass filter cuts off at high frequencies, resulting in a pressure interference unidirectional microphone. Dual ribbon... required crossover network and restricted frequency range. Fairly poor vertical patterns due to element spacing. and did restrict range on the figure 8 setting. Good vertical polar pattern. back port on a second ribbon that is electrically selected. Close the port on this section for omni. Only one element is active at a time, so better vertical patterns are achieved as well. switching along with mechanical valve opening and closing. But we knew this was the way to go, and proceeded with it. What is it? the RCA 77s had it as well as the KU2 skunk, KU3, BK5B, and Starmaker. It turns out that any velocity sensitive pressure microphone like a dynamic or ribbon has to be resistance controlled...that is the largest reaction force needs to be a dissipative friction like force. 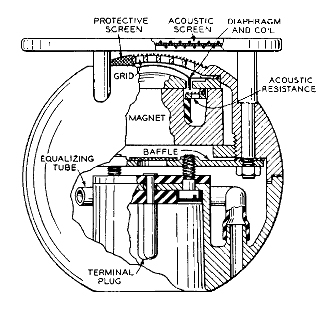 This was done early on at Bell Labs by having a dynamic mic diaphragm pump air through a layer of silk fabric or the like between it and a compliance chamber, resulting in the famous eight ball mic. It's still done today on pressure microphones, and in the case of variable D as developed by Electrovoice unidirectional mics as well. frequencies...in the range of the geometric mean of the desired frequency extremes. With low tuned ribbons a compliance chamber would have to be very large...a patent of the day for such a thing mentioned a15 cubic inch volume! Dr. Harry Olson seemed to realize this pretty much from the beginning and chose another method for creating a stable, known resistance: a transmission line. of cross sectional area of a pipe. The right loading for the ribbon was found to result in a pipe of 6-9 mm diameter. by "driving with the brakes on". Hence it was called the labyrinth. In the 77 it was created either as stacked spiral plates or a phenolic block drilled with many interconnected holes. 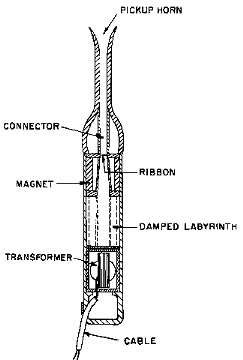 this resonance, and he did so by stuffing the tube with fibrous sound absorbing media resulting in a lossy transmission line. still caused some pretty bad resonances, particularly in the RCA 77 series, that created a very large midrange response hump as shown. We were able to correct this very effectively with geometry changes and some acoustic networks. Obviously we have great advantage today with modern neodymium magnets. Fairly large flux density is required to get good output from a ribbon microphone. In past times high flux densities were possible only with large heavy magnetic structures. We were able to get high flux with much smaller magnets and a FEA optimised magnet structure. We used several methods to get the desired wide smooth frequency response. Body reflections are always an issue. We use carefully placed resonant traps to eliminate them. Mass controlled ribbons need some acoustic damping to prevent large peaks at harmonics of the ribbon fundamental resonance. Doing so tends to reduce bass response and sensitivity however. To recover that we use a low resistance baffle around the ribbon. 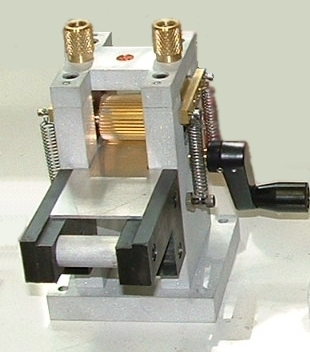 it becomes a significant portion of the near field path impedance and acts as an obstacle, increasing output. The ribbons must be formed accurately and consistently for predictable performance. To achieve the performance we want the ribbon to pole piece gap is only 0.1mm. We developed a precision preloaded ball bearing corrugating machine to insure this. Several other ribbon microphone firms bought these machines from us for their production. and tuning testing with an electrical impedance meter. The labyrinth stuffing operation is monitored with an acoustic impedance meter. and the results are printed and included with each microphone. frequency range and very smooth response but retaining the warm quality ribbons always had.